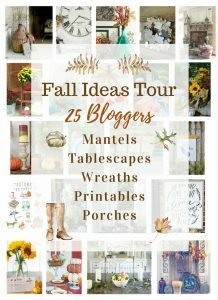 I’m so excited to be here today as part of the Fall Ideas Tour – 25 bloggers sharing new ideas for your Fall mantels, tablescapes, wreaths, printables and porches. And, I’m especially excited because I got to decorate an outdoor space for this tour. 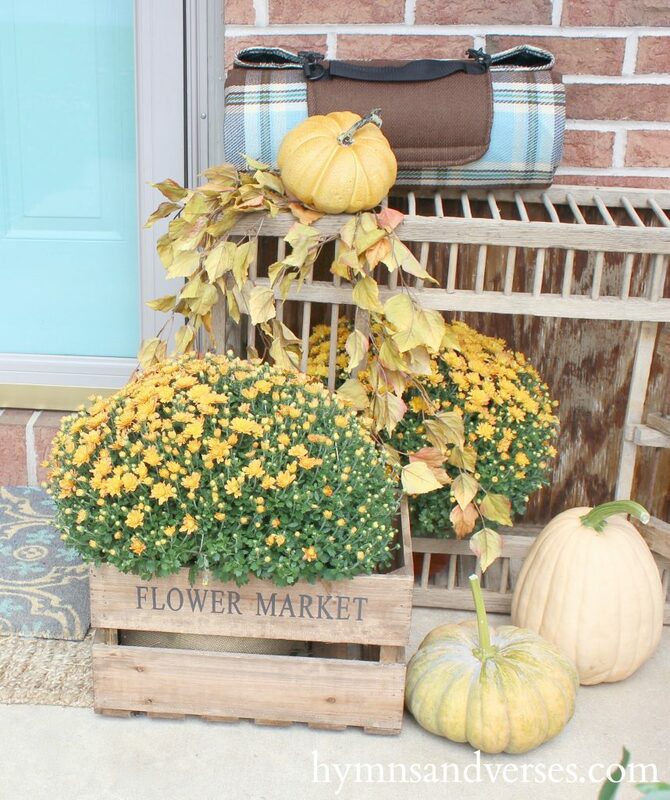 Today is porch day and I’m sharing my welcoming Fall front porch. For me, Fall outshines all the other seasons. Even though the temps are cooler outdoors, the colors displayed in nature are so warm! And, of course, we try to bring that warmth into our fall homes. And, why not begin by making your entryway or porch warm and welcoming! Don’t let that fact that you don’t have the porch of your dreams hold you back from making what you DO have welcoming for your family and friends. My front porch isn’t anything special. To be completely honest, I don’t like it. It’s long and narrow and has always been a challenge for me to decorate. But, the more I work with the space, the more I do get new ideas to maybe make this space look better and be the welcoming front porch that I want it to be. The focal point of your front porch or entry is the front door. A few years ago I painted my front door Benjamin Moore Mill Springs Blue and I love the warm blue green shade. When you decorate your front porch, you definitely need to use colors that are complimentary to your front door. Bright orange looks amazing with my front door color, but this year I decided to bring down the tone of the orange with a variety of pale orange pumpkins! I couldn’t believe my luck when I found these pale beauties! And, the color of this Mum is called Amber – a warm golden shade. You may recognize the chicken crate! Yes, I just brought it out to the porch and propped it on its side. I thought it was a nice rustic accent to balance out the straw bale on the other side of the front door. And, isn’t it fun that the color in the plaid picnic blanket is the perfect match to my door! And, isn’t the color of that blue Hubbard Squash amazing! And, wouldn’t it be so adorable if this cat’s name was “Pumpkin” ? Nope, not pumpkin! His name is Scout and he’s the sweetest and coolest cat in the neighborhood! Thanks for stopping by today to see my welcoming fall front porch! You can see more of my fall porch decor by following the link below. 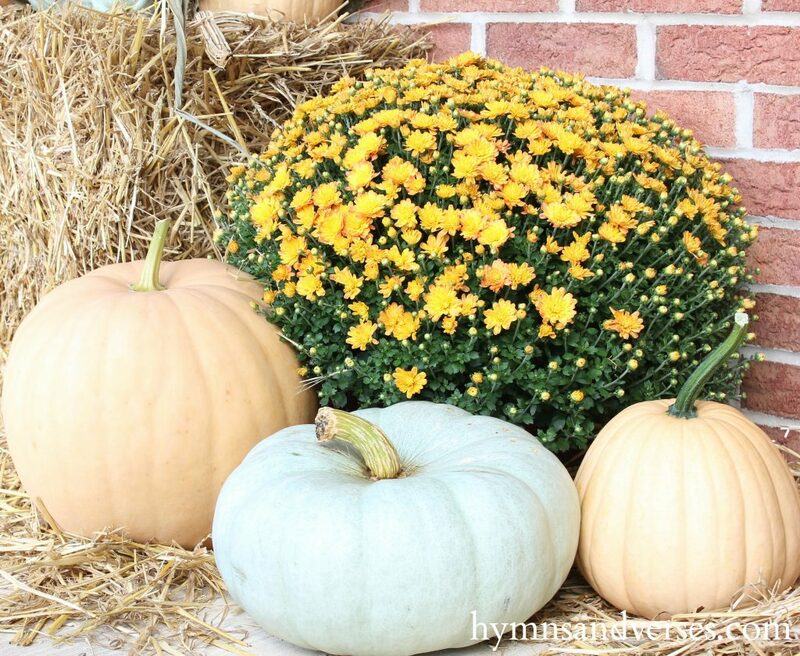 I hope you will check out all of the other bloggers who are sharing their Fall Porch Decor today! The links for today’s Porch Tours, as well as, all the other tours from this week are below! I hope you’ll take some time today or this weekend to visit each one. As bloggers we love to share our Fall ideas with you in hopes you will be inspired to bring some Fall warmth into your own home! Happy weekend! For even MORE Fall inspiration . . .
Oh Doreen,how can one not smile from ear to ear as they approach your amazing porch. 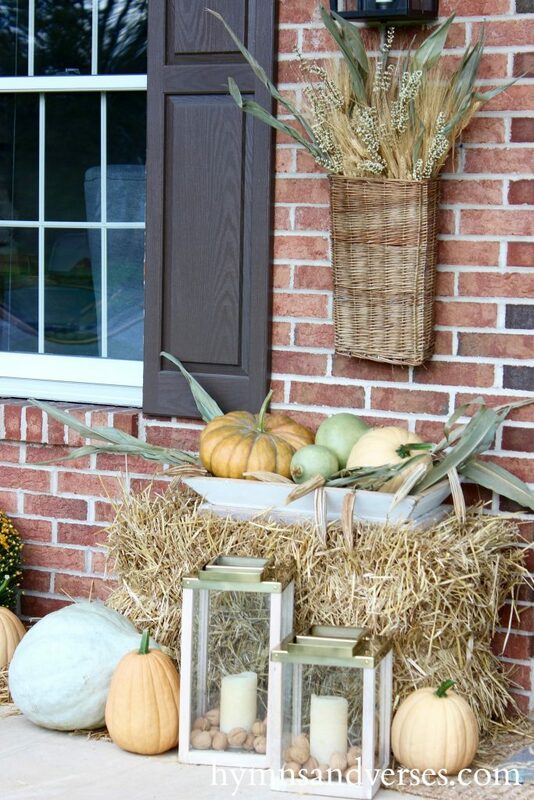 Fall perfection from the displays with the hay bales to the chicken coop vignette. Beautiful colors to coordinate with your pretty door. I am a bit envious of your pumpkins…I was unable to get them here…soon I hope! Happy Fall Doreen!!! I love the chicken crate/coop incorporated into fall porch decorating! The straw bales, pumpkins, mums and lanterns all create a wonderful fall welcome. I’m anxiously awaiting for the pumpkins to arrive at our garden center! 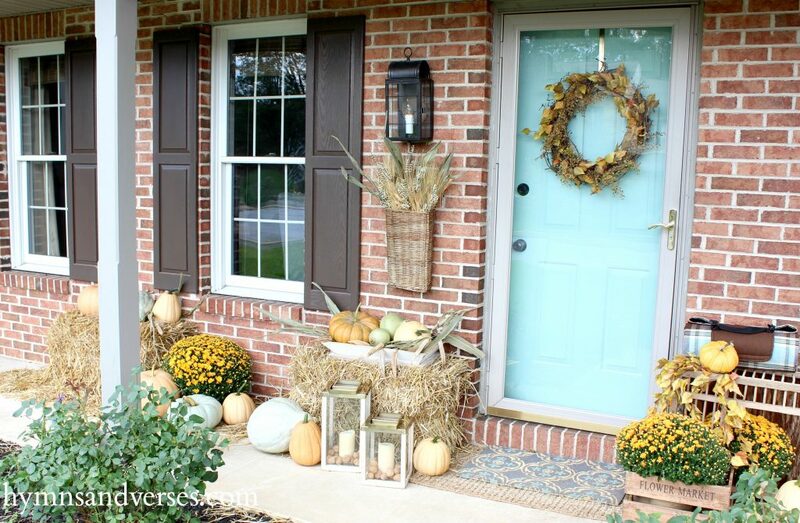 What a beautiful and welcoming fall entry you’ve created! It looks so nice and inviting and I’m sure that everyone who sees this will stop to admire it. Very pretty…..I admire the wall basket….also the use of natural colors. Your front porch is so beautiful and welcoming. You were so fortunate to find those pumpkins and in those fabulous hues too! The chicken crate looks like it belongs there – everything blends so perfectly well together. Happy Fall! Hi Doreen. I was excited to see your porch and all of the Fall elements. You porch is inviting, colorful, and creative. Everything that I am drawn to. I am crushing on your chicken crate and the blue pumpkin. 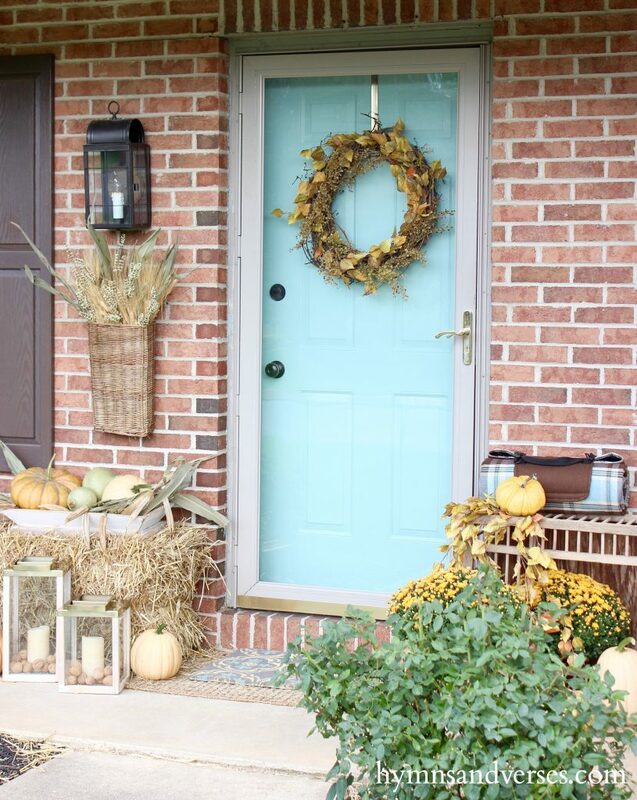 Thanks for sharing you Fall porch ideas. Now, I am excited to decorate my porch. Have a wonderful Fall. Oh my, I could hang on that porch for days and days. I’m using those same colors in my fall decor this year but it won’t be nearly as beautiful as yours. Love it ALL! Beautiful color palette and natural fall goodness! Love it! *Note to self-must grow blue pumpkins next year!!! Your front entry is indeed so warm and welcoming. That shade of mums does look great with your front door color! And pulling out the chicken coop is genius! If I see one for sale, I’m gonna grab it! Its all so fun and welcoming! Love the coop and the beautiful pumpkins!! 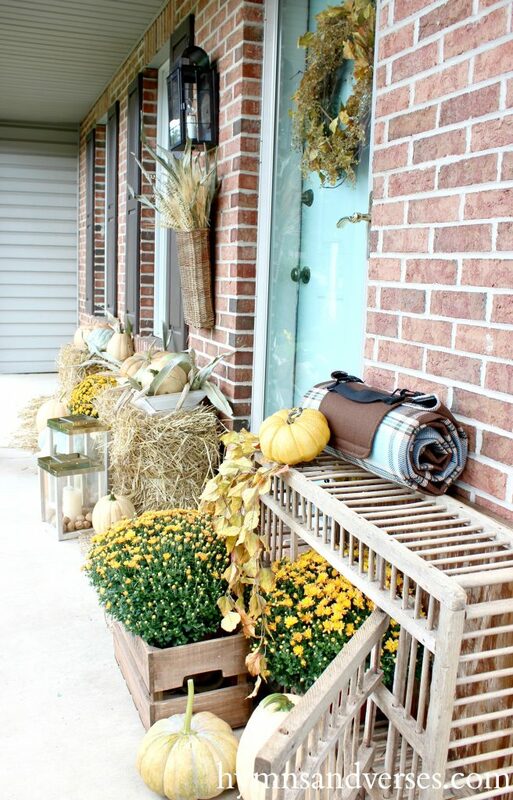 What a cozy and welcoming fall porch Doreen! LOVE it! 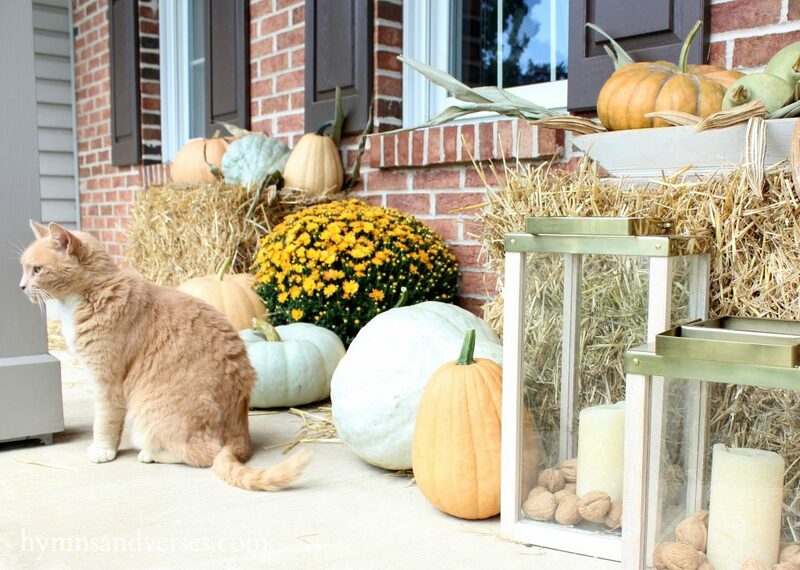 I love your sprawling porch and all the pumpkins, little Scout is so cute!!! Beautiful porch! Oh my goodness! That door!!!! And it pairs so perfectly with all of those muted Fall colours! Love everything about your porch. It might be small, but it’s packed with style.